Vegan NPD is moving fast. Demand for portable plant-based food and drink products has skyrocketed and both brands and retailers have come up with plenty of innovative launches for the vegan lunchtime meal deal. From fishless sushi to pig-free bacon crisps, here’s our pick of the best new vegan food-to-go products. This veggie-filled wrap joined the Planet Organic food-to-go lineup in July and combines slow roasted tomatoes with carrot, red cabbage, roasted red peppers and fresh avocado. The packaging is plastic-free and made with “planet-friendly” paper. It’s also nut-free. Landing on shelves ahead of Christmas, this sandwich contains a sweet potato bubble & squeak fritter, pickled beetroot and red cabbage slaw and Christmas spiced chutney. It will be available as part of the Co-op meal deal. Made with cauliflower, carrot and cabbage, this salad hit M&S shelves in June. Containing a pot of basil and thyme dressing, the salad is garnished with parsley and pumpkin seeds. Waitrose launched a raft of vegan options in its Good to Go range in January but this sandwich only came into stores last month. This vegan take on a classic ploughman’s includes a dairy-free cheddar style slice, pickle, tomatoes and vegan mayo. Asda first launched a range of vegan food-to-go products in January this year. The latest addition is this Spicy Butternut Falafel, Rainbow Grains & Houmous Salad. The product, which carries a Vegan Society accreditation, comes equipped with a fork and mini pot of houmous. This new launch from vegan sushi brand Ima promises to leave “plenty of fish in the sea”. Available from Planet Organic and Greenbay Supermarket, it’s a seaweed wrap with barbecue marinated jackfruit and carrots and it comes in sustainable sugar cane packaging. The combination of courgette, cannellini beans, plum tomatoes and sunflower seeds makes this pasta pot high in plant protein and low in sugar. It became available in Sainsbury’s stores from the end of October. 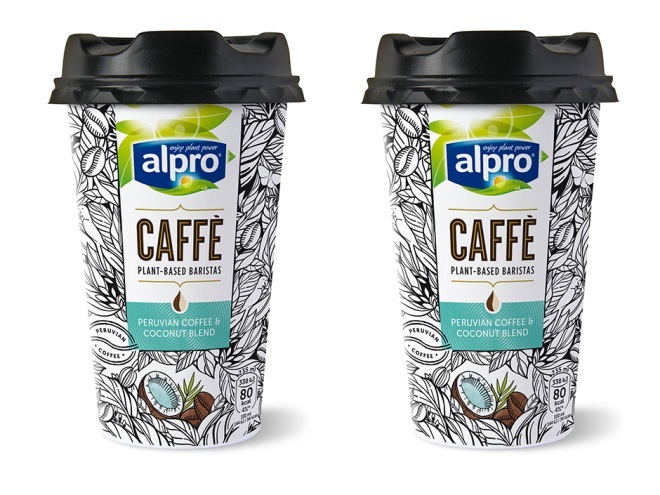 Available in three flavours: Soya Caramel & Ethiopian Coffee, Coconut & Peruvian Coffee and Almond & Brazilian Coffee, this ready-to-drink chilled coffee hit the meal deal shelves of Boots in October. Despite having a “subtle bacon flavour” these hand-cooked crisps are the first vegan-friendly meat flavour the brand has created. They entered Co-op stores in September. A “healthier version” of classic chocolate cups, these plant-based treats are now available in Selfridges and Daylesford in Peanut Butter, Rocky Road and Coconut varieties. Available in handy snack packs, the cups are free of refined sugars, gluten and are made with natural ingredients. A vegan reinvention of caramel shortbread, these bars contain up to 12g of protein and are available in three flavours: Peanut Butter, Raspberry and Orange. The bars layer oats and quinoa with date paste and cacao nibs. They’re now available from Boots and WH Smith. Naturally vegan, this on-the-go peanut butter format hit Tesco shelves in May. The snack only contains hi-oleic Australian peanuts and a pinch of salt. Available in Choc Matcha and Mixed Berry flavours, these cashew and date balls contain one billion vegan probiotics. Made in Australia, they’re set to hit major UK mults, specialist retailers and online retailers in January 2019.